1. The loneliness...not speaking the local language fluently is socially isolating; how I longed to have a casual conversation in English with a good friend. 2. Beds + bed skirts = total living nightmare...combined travel time for acquiring the proper size bed skirts, box springs, and mattresses came to somewhere around 40 hours; and it's all more expensive here too. To think, I could pick up a simple bed skirt for $20 at Target back home! 3. It would take so long...did we seriously just extend our trip 2 months? 6. That once you found the good workers, it would be difficult to get them here more than a few hours at a time considering how busy they were and the short work week here in France. 7. Only one leather sofa in France would fit through our second story door! 8. I would be required to do so much legwork by myself; meaning I would have to try and speak French on my own about house-related subjects! It's one thing to ask for a bunch of onions, but another to discuss the dimensions of a room and how old something is in a foreign language. If only I had a nickel for every time I made a complete fool out of myself! 9. 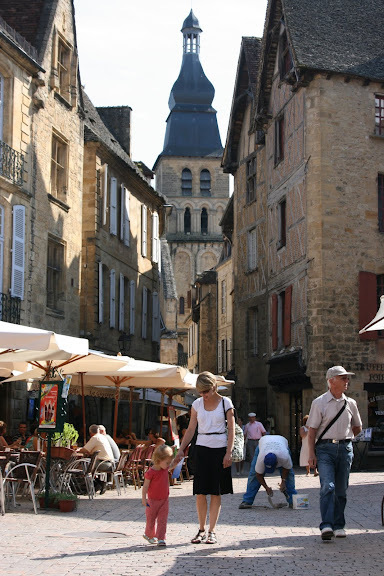 I would see my adorable neighbors and meet a lovely blog reader right here in Beynac. 13. How much I want to stay here now...with just the Husband; La Maisonnette is quite romantic and honestly made for 1-2 couples. 16. To receive mail...thank you Christine for everything! 17. The Husband was so handy! one of my first battles in france when i got here was over bedding. "housse" is my least favorite word in the language. i ended up buying a duvet cover (housse de couette) instead of a fitted sheet. then i got into a fight with the woman who wouldn't let me return it because i opened it. and i must say "twin" is much easier to figure out than 90x180 (or whatever it is)! I would love some tips you have for travel with children. Especially international flights with young ones. We struggle with 2-3 hours across the states. Just thinking about kids in Europe makes me shudder because of that long flight. How did you do it? I hear you on #1. I remember how excited I would get when we would find ourselves at a store in Vermont and I could finally understand what someone was saying! What an experience this has been for you! I can't wait to hear your stories when you return. You've been missed!! By the pictures you post and the different stories you tell...... I think it all sounds like it will be worth it. Hang in there.... I have never been to France... How do you like the French people and how helpful are they if you don't speak French. I am so impressed by the way you're handling things! Way to go! I wish you could know how many of us are reading along, feeling your pain, exhaustion, simple joys and little miracles. We're cheering you on! I think you and your family are going to look back on this summer as one of the greatest of your life. The aggravations will be forgotten and your investment of heart, soul and labor will pay off for the rest of your life with sweet memories and of course that beautiful cottage. It's SO great for your kids to see hard work, problem-solving and the ability to make lemonade out of lemons! You are in the middle of one of the greatest experiences of your life. You'll miss it when it's over, even though it's so painful at times now. Love it while you can! We're admiring your efforts and appreciating the life lessons you're sharing with us! Love seeing you strive & conquer. loved this post steph :) and u look beautimous & vogue in the picture above. I've loved following along on your adventures. Thanks so much for sharing. I've spent most of the past four years living abroad and I have days where I love those little surprises and days when I could just jump in the car and drive to Target for a quick solution. But in the end I know that working to overcome those struggles and the lessons I learn as I do are the reason I've chosen this life. Best of luck and I hope to visit your beautiful French home some day soon. Ah, Stephmodo. You are impossibly chic and I love to watch your adventures. This is voyeurism on a level I've never experienced! You sound a little sad or wistful today. Buck up, little camper. Life is beautiful. I agree with some of your comments. We have a house in Normandy where we usually stay for the summer. I do speak French pretty fluently but not like a native speaker. I try to stay open-minded and not focus on speaking perfect French. In the past, I have been surprised with the conversational exchange I have had with "les commercants" or even some of the locals. Hang in there Steph....and yes, let's apple-pick when you return! I would love to hear of your adventures! we were in Brantome area for only a week and I longed for Target. My son forgot his swim trunks. We had to buy a pair for $40. There were no other options. I've been following your blog for quite some time, but now am FINALLY leaving a comment. I'm all the way from Houston, TX, not yet married, no children, but am in complete awe of your inspirational life and blog. Even with all the daily bumps in the road, the path you and your family are on is a dream of my own that I hope to have come true one day. good luck on all that's yet to come and I look forward to keeping up with your blog! thank you for sharing all the beautiful and inspirational stories & pictures! My first normal conversation in English at home was at Duane Reade with a cashier. I almost cried. I will let others comment on your realities and learnings. I will just comment on the picture of you and Sophie; it is wonderful! Congrats to the photographer. Perfect. #5- so it is not as easy as "Under the Tuscan Sun" makes it look? Did you cook and sioree with your workers? I giggled the whole time I read this post! I lived in France for two years, and one of the biggest nightmares was dealing with household problems ie. plumbing, setting up cable, water bursting from a faucet because you are from California, and you don't know that you have to turn a small handle under the sink in your kitchen when winter comes!! OH the joy. It took over a month for them to install our kitchen, because as you know, most homes don't come with the kitchens in France. So....millions of trips to IKEA, and speaking in broken French was how our live was for a good three months or so. Everything you listed , I totally agree with! Did you ever read " A Year in Provence" by Peter Mayle? I did before I moved there and it really helped me with what could happen. I truly love your place , and like I said in my other comment, I will look into your place when I go back to visit my son in laws folks. Just wondering if eBay allows you to sell [url=http://www.ticketchoice.com.au]concert tickets[/url] on the internet? Do you know if you will discover any restrictions depending on what country you're in? My parents have just called me and asked if i could "get rid" of their two tickets to a concert as they wont be able to make it due to yet another family event. Besides asking friends etc, i thought ebay would be a fantastic place to sell them. But whats ebay's policy on marketing tickets? Ive heard alot about it for the news but ive forgotten what happened. Just wondering if eBay enables you to market [url=http://www.ticketchoice.com.au]concert tickets[/url] on the internet? Do you know if you will discover any restrictions depending on what country you are in? My parents have just referred to as me and asked if i could "get rid" of their two tickets to a concert as they wont be able to make it because of yet another family event. Besides asking friends etc, i thought ebay would be a fantastic place to market them. But whats ebay's policy on promoting tickets? Ive heard alot about it about the news but ive forgotten what happened.